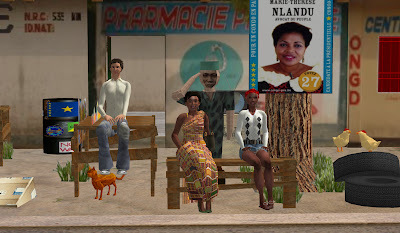 The Mixed Reality documentation KINSHASA 2.0 was produced in the context of the project "Why Democracy" and deals with the political situation within the Democratic Republic of Kongo as well as the possibilities of the internet to strenghten democracy. The film was realized making use of the virtual world Second Life®. The scenes that were shot inworld have been produced by the agency YOUin3D.com from Berlin. Director: Teboho Edkins. Teboho Edkins was born in the USA in 1980 and grew up in mainly in Lesotho, but also Germany, South Africa and France and now lives in Berlin. He studied Fine Art in Cape Town, did a 2-year post-graduate residency at le Fresnoy, studio national des arts contemporains in France, and is currently in the post-graduate programme of the dffb film academy in Berlin. He has received numerous scholarships and prizes. Teboho Edkins on stage after screening of Kinshasa 2.0 at Berlinale 2008 in Berlin. His film explores a tense, militarised Kinshasa, where it is extremely difficult to film, and using Second Life® – a 3D virtual chat program - he looks at his friend Carine’s attempt to keep in contact with her aunt Marie-Thérèse after she is released and goes into exile in Belgium. Pictures from the "Making of" see here.